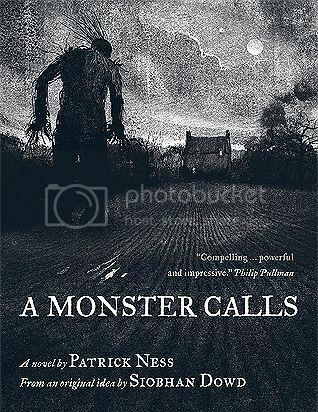 A Monster Calls is the very first book I've read by Patrick Ness, although I have quite a few of his books on my TBR at the moment. I decided to include the book in my Halloween Reads week, because the cover for the book looks amazingly creepy, and also because I recently watched the movie trailer, and I was super curious about the story. I am SO glad that I decided to read this book. I loved it, and I just know that it's one of those books that I will remember always. It was SO easy for me to relate to the main character in the story, Conor. I've been in his shoes more times than I care to remember, although not with a parent, but with other family members that have been more like parents to me. Conor was really a great kid, and I felt bad for him for what he was going through. The Monster in the story is not at all what I expected, but I absolutely loved him as well. I didn't really read much about the book before I started it, so the storyline was completely different that what I thought it would be. I loved it regardless, and I was completely engrossed in the story. It's definitely one that so many people will be able to relate to in some form or another, and the story will stick with you long after you've closed the last page. Coming in at just 216 pages, some of which included beautiful illustrations, this book was a really quick read. I flew through it faster than I anticipated, and I was really sad when the book came to an end. But, I loved the story, and I can't wait to see how the movie compares. I didn't find out until after I had read the book that the audiobook is narrated by Jason Issacs! I wish I had known this sooner, as I really love the sound of his voice, and I'll definitely be checking out that audiobook as soon as possible. Overall; I don't feel like I've done a very good job of expressing how much I loved A Monster Calls, but I'm hoping you get the point. I really, really enjoyed everything, from the characters to the storyline, and I'm definitely excited to read more by Patrick Ness as soon as possible. If you decide to check out A Monster Calls, I hope you enjoy it as much as I did. I read this a couple of months ago and I had a hard time properly expressing myself as well. It's a beautiful book. Great review!